I regretfully announce the resignation of [Mr. X] from [company name] effective [some date]. [He/she] will be [returning back home, joining another company, continuing his studies, etc…]. This is a great loss for us but we can only respect [his/her] decision and wish [him/her] the best. Since [his/her] joining in , [Mr. X] was a valuable member of our team. [His/her] contribution was essential to our success, which we very much appreciate. [His/her] colleagues recognize [him/her] for [his/her] courtesy, charm, and great work ethics. [He/she] will be deeply missed. Please join us on [date and time] at [location] for [his/her] farewell party and to thank [him/her] for [his/her] dedication and efforts over the years. It is with mixed feelings that we announce the departure of [Mr. X] effective [some date]. It is always sad to lose a dedicated, hardworking, and a regular top performer. Our only consolation is that [Mr. X] is comfortable with [his/her] decision and deems it as a step forward in [his/her] career. [Mr. X] will be [joining another company, continuing his studies, etc…]. [Mr. X] has contributed a lot to the success of this organization. We acknowledge [his/her] efforts and thank [him/her] for the unconditional commitment and dedication throughout the years. On behalf of everyone at [company name], I would like to wish [Mr. X] the best of success in future challenges and endeavors. I am sad to announce that [Mr. X] will no longer be working with us starting [some date]. [Mr. X] decided to [return back home, join another company, continue their studies, etc…]. We all regret [his/her] leaving but we can only respect [his/her] choice and wish [him/her] the best. [Mr. X] has given so much to this organization. [His/her] efforts are well recognized and we shall always remember how important [he/she] was for us. Filling [his/her] shoes will not be an easy task, so we wish all the luck to [Mr. Y], our new [head of accounting, marketing manager, etc…]. To honor [Mr. X] and as a token of appreciation, please join us for his farewell party on [some date] to thank [him/her] for [his/her] dedication and wish [him/her] success in the next endeavor. 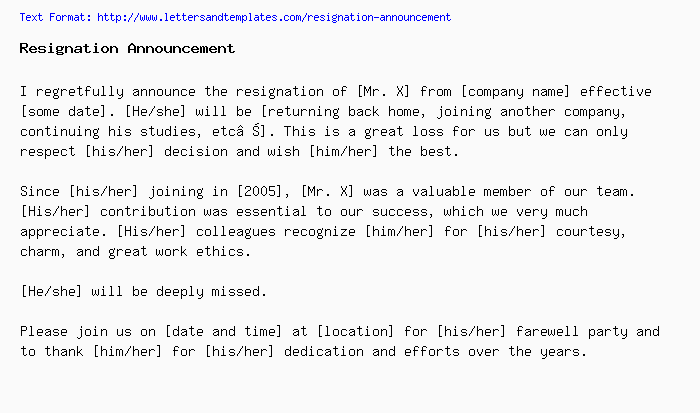 I sadly announce the resignation of [Mr. X] from [his/her] position at [company name]. It has been a wonderful opportunity working with a professional, dedicated, and a passionate person like [him/her]. It is to our misfortune that [he/she] has decided to join [another company name]. This is undeniably a gain for them but we can only respect and honor [his/her] choice as [he/she] believes that this is for the best. On behalf of everyone at [company name], I would like to thank [Mr. X] for his efforts and wish [him/her] the best of success in their future challenge. We would like to inform you that [employee name and job title] will no longer be working with us effective [last working date]. [Replacing employee name] will be assuming [leaving employee]’s duties. We would like to regretfully inform you that [employee name and job title] will no longer be working with us effective [last working date]. This is a great loss to the company but we can only wish [leaving employee] the best of luck in [his / her] future challenge. [Leaving employee name]’s duties will be assumed by [replacing employee].